Presenting or speaking in public – as you will likely have experienced – makes people nervous… In fact, it’s one of the commonest social fears. 1. Why do we get nervous? When we are faced with a dangerous or difficult situation our body’s automatic “fight or flight” response kicks in, pumping adrenaline into our bloodstream. In its most extreme form, it produces a condition psychologists term ‘glossophobia’ – where the sufferer literally freezes and can’t speak. 2. How does it affect our performance? A) When does your audience judge you – deciding you’re a ‘good’ presenter with an interesting message for them (so you’ve got their attention)… or vice-versa (so they switch off)? 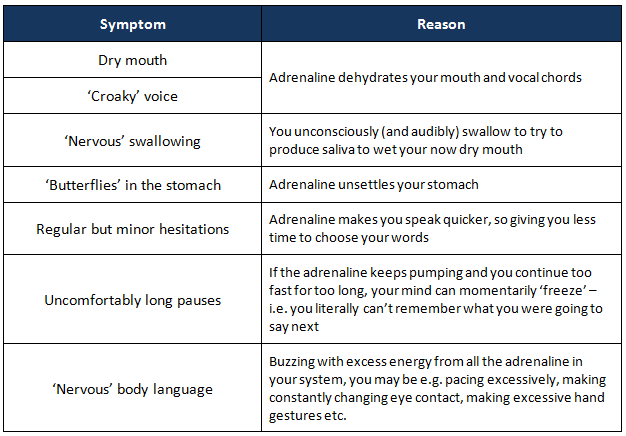 B) When do nerves affect us the strongest? C) How often do speakers recover after a ‘nervy’ start and fully recapture the audience’s attention? So, we have a crucial coincidence of the peak of a speaker’s nerves and ‘instant’ audience judgment together with the fact that if you don’t start well, you’ve lost an ‘ideal’ level of audience interest and impact you will most likely never fully recover.